As you keep on using your iPhone, you will notice that after a while it will start having several small issues. This is very natural in any phone that has been used for a few years. You may be facing issues such as lack of space, even after you delete multiple files from your iPhone, or you may be experiencing lags in operating your iPhone. These problems may occur due to a glitch in the software and can be fixed easily by restoring your device to the factory setting. Restoring your device to the factory setting or to an older backup, is like starting anew with a brand new iPhone, which can be easily done by anyone. However, during restoring your iPhone, you probably would be asked to update your phone, which is not something that many people want. Fortunately with the help of this article, you will learn how you can restore your iPhone to fix the software issue without updating it. Bonus Tips: If you have problem in iTunes syncing, you can always use Jihosoft iPhone Data Recovery to extract and recover important data from iPhone, such as photos, messages, contacts, call logs, notes and so on. 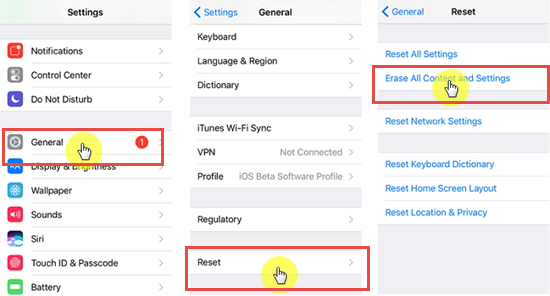 One method that you can use quickly restore your iPhone without updating is to directly reset iPhone from its settings. First create a backup of your device using iTunes if you don’t want to lose data; Connect your device to your PC and open iTunes. After it detects you device, click on File (menu) > Devices > Back Up Now. If you already has a backup, you can skip this step. Once your backup is complete, unplug your iPhone from your PC (don’t close iTunes) and then go to the Settings on your iPhone. Click on General > Reset > Erase All Content and Settings, and confirm your action. Once your iPhone has been reset, don’t follow the setup page, directly plug it in your PC with iTunes running. After iTunes detects your device, click on the iPhone icon and go to Summary > Restore Backup. Click on “Cancel” every time if it asks you to update iPhone. Once your backup has completed restored to your device, disconnect your iPhone immediately, or iTunes will automatically update your iPhone to the latest official iOS version without asking you. With the help of the recovery mode, you can restore your iPhone without updating iOS. If you have an iPhone 7 or later versions, you can follow these steps to restore your device. Plug your iPhone into your computer to create backup with iTunes. If you already have a backup, then skip this step. Now turn off your device and then put it into recovery mode: Press the side button and volume down button together at the same time, and holding those two buttons until the “Connect to iTunes” appears. Connect your iPhone to your PC; a dialogue box will open up on the iTunes, click on the “Restore now” option and pick the latest backup. Once you click restore, your iPhone will be restored, at any point if you see a dialogue box asking you to update your iPhone, select the “Cancel” option. After the backup is complete, disconnect your iPhone from the PC but do not close the iTunes. Put your device in recovery mode by pressing the Power button and the home button at the same time; release the power button after your phone has switched off but keep on holding down the home button until you see the recovery mode screen. Connect your iPhone to your PC select the Restore Backup option poping up in iTunes and pick the matched backup. Once you select the restore option, your iPhone will be restored, at any point if you are asked to update your iPhone select the “cancel” option. Connect your iPhone to your PC, and run iTunes. Select the device icon and then click on the Summary option. Under the Backup section, select the Restore Backup option. Select the name of your device and then the date of the backup you want to restore. If you have a backup of your phone, then it becomes easier for you to restore it without updating to the newest version of the iOS. Hence, it is useful if you schedule regular backup for your iPhone. Since you can back up all your data on iPhone with either iTunes or iCloud in a matter of minutes, backing your data up every few weeks can reduce the loss if you need to reset iPhone. Not many people prefer to update their device, probably because they enjoy the current status or are afraid of any potential lag or bug in the new version. Now with this article, you can skip iOS updates every time you want to restore your device. We hope that these method can be of great help for you, and welcome any question or suggestion from you in the comment below.